After a long spell with few earthquakes strong enough to be felt, over the last ten days we've had 3 earthquakes larger than magnitude 6, seven larger than M5, and more than fifty larger than M4. With earthquakes being felt in Southeast, Southcentral, Fairbanks, and the Aleutians, it's likely that most Alaskans already have felt an earthquake this month. Here's a quick recap. At 4:31am on May 1, a M6.2 near the Haines road was felt throughout Southeast Alaska and much of the Yukon. Less than two hours later, a M6.3 struck in almost the same place. While no damage was reported in Alaska, much of Whitehorse lost power, there was some structural damage, and climbers on Mount Logan reported dangerous avalanches and serac falls. 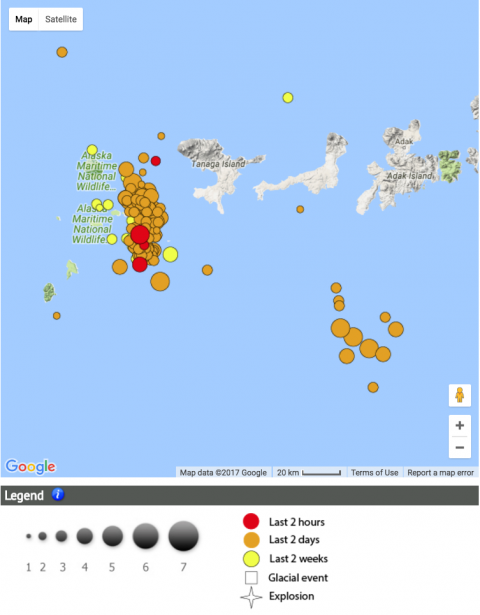 As of May 10, we have located more than 800 aftershocks from these earthquakes. On May 6, at 8:25pm, a M5.2 earthquake struck 10 miles north of Ninilchik on the Kenai Peninsula. This was a very common type of event for the Cook Inlet region, occurring at a depth of about 40 miles in the subducting slab. This earthquake was felt by many in Southcentral, with reports coming in from as far away as Valdez and Palmer. Nearer the epicenter, some reporting books falling from shelves and pictures falling off walls. Then on May 7 at 9:09pm, Fairbanksans felt a magnitude 3.8 that occurred 20 miles northeast of the Fort Knox Gold Mine. 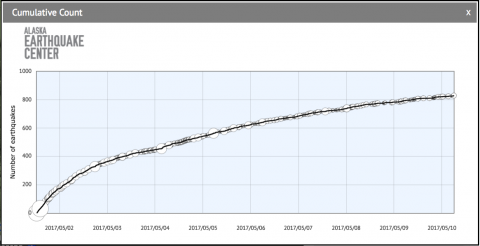 Which brings us to the interesting Aleutian sequence that began on May 8, when three earthquakes were felt on Adak from 7:31 to 9:00 that morning. First, two M5.5 earthquakes occurred just 16 minutes apart, about 80 miles south of the island. These were typical megathrust events, occurring at depths of about 25 miles. Then, 73 minutes later, a M6.2 earthquake struck to the west, between Tanaga and Gareloi volcanoes. The M6.2 was the largest quake in the Andreanof Islands so far this year, and it started a vigourous aftershock sequence. In just two days this sequence has produced nearly thirty earthquakes greater than magnitude 4, including three larger than magnitude 5. A magnitude 5.9 late on Tuesday night suggests that this sequence will continue to be very energetic for some time. These earthquakes are occurring along one of the area's poorly defined crustal faults, which occasionally produce magnitude 6+ earthquakes. The most recent similar sequences began in April 2008, with magnitude 6.4 and 6.6 events west of Gareloi, and in May 2008, with a magnitude 6.6 event east of Tanaga. Were Monday's magnitude 5.5 quakes and magnitude 6.2 quake related? Coincidence is possible, but the close timing suggests some relationship. However, they occurred 100 miles apart, at different depths, and in different ways, so we simply don't have enough information yet to show if and how they might be connected. This is a cross-section looking at the depths of earthquakes from the last two weeks across Cook Inlet. 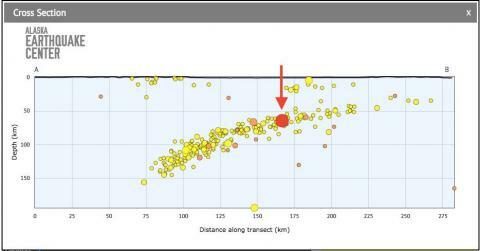 The May 6 M5.2 (arrow) fits nicely with the seismicity of the subducting Pacific plate underneath North America. Andreanof earthquakes larger then magnitude 3, May 8-9. The smaller sequence at the lower right includes the two M5.5 events and their aftershocks. The much larger cluster to the left shows the crustal sequence, including the M6.2 Monday morning and the M5.9 Tuesday night. This sequence produced around 200 earthquakes in just two days.